Portrait of Ross Shaw Sterling. Image courtesy of the Texas State Library and Archives Commission. Image available on the Internet and included in accordance with Title 17 U.S.C. Section 107. 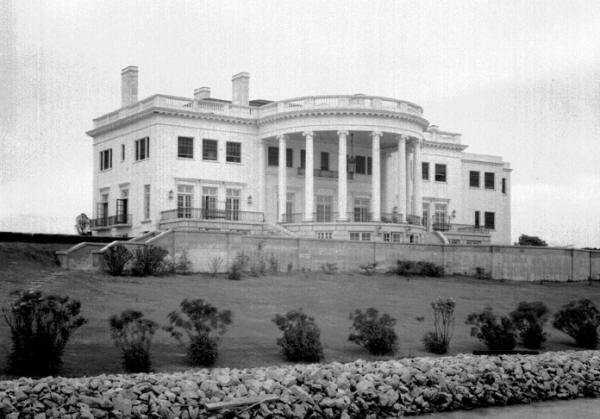 Former Governor Sterling's Mansion in La Porte. Image available on the Internet and included in accordance with Title 17 U.S.C. Section 107. 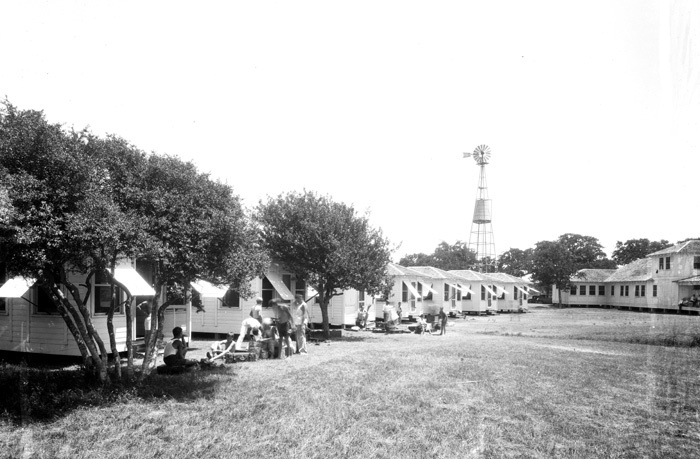 Camp Ross Sterling, Jr. at Cedar Point on Trinity Bay, 1931. Image available on the Internet and included in accordance with Title 17 U.S.C. Section 107. Ross Shaw Sterling's Grave. Image available on the Internet and included in accordance with Title 17 U.S.C. Section 107. STERLING, ROSS SHAW (1875–1949). Ross S. Sterling, governor of Texas, son of Benjamin Franklin and Mary Jane (Bryan) Sterling, was born near Anahuac, Texas, in February 1875. Biographical sources give different specific birthdates of February 11 and February 22, due to the change from the Julian (Old Style) to the Gregorian (New Style) Calendar. He attended public schools and farmed until about 1896. He opened a feed store at Sour Lake in 1903, and during the next several years he also entered the banking business by purchasing a number of banks in small towns. In 1903 he became an oil operator and in 1910 bought two wells, which developed into the Humble Oil and Refining Company (see EXXON COMPANY, U.S.A.). The company was officially organized in 1911, and Sterling was president. In 1918 he also was president and owner of the Dayton-Goose Creek Railway Company. In 1925 he sold his Humble interests and started developing real estate in the vicinity of Houston. He bought the Houston Dispatch and the Houston Post in 1925 and 1926 and subsequently combined them as the Houston Post-Dispatch, which later became the Houston Post. Sterling was chairman of the Texas Highway Commission in 1930 and was instrumental in highway development in Texas, including the implementation of the 100-foot right-of-way for highways. On January 20, 1931, he was inaugurated governor of Texas. In September 1931, during the Great Depression, he called a special session of the legislature to deal with the emergency in agriculture. The Texas Cotton Acreage Control Law of 1931–32 was designed to cut cotton acreage in the state, but it was declared unconstitutional and never went into effect. Because rulings of the Railroad Commission regulating oil proration in East Texas were being ignored, Sterling placed four counties under martial law and shut down all oil production temporarily. Later the courts ruled that he had exceeded his authority by the declaration of martial law. Sterling was defeated by Miriam A. Ferguson in his race for a second term as governor. In 1933 Sterling returned to Houston, where he appeared little in public life, but in a few years had built another fortune in oil. He was president of the Sterling Oil and Refining Company from 1933 to 1946. He was president of the American Maid Flour Mills and the R. S. Sterling Investment Company and was chairman of the Houston National Bank and the Houston-Harris County Channel Navigation Board. Sterling married Maud Abbie Gage on October 10, 1898; they were parents of five children. Among his philanthropies were the gift of his La Porte home to the Houston Optimist Club for a boys' home, establishment of a boys' camp in memory of Ross Sterling, Jr., who died in 1924, and the contribution of $100,000 to Texas Christian University. He was a Democrat and a Mason. Sterling died in Fort Worth on March 25, 1949, and was buried in Glenwood Cemetery in Houston. Houston Post, March 26, 1949. Henrietta M. Larson and Kenneth Wiggins Porter, History of Humble Oil and Refining Company (New York: Harper, 1959). Ross Shaw Sterling Papers, Dolph Briscoe Center for American History, University of Texas at Austin. Vertical Files, Dolph Briscoe Center for American History, University of Texas at Austin. Who's Who in America (1934–35). Handbook of Texas Online, "STERLING, ROSS SHAW," accessed April 25, 2019, http://www.tshaonline.org/handbook/online/articles/fst42.